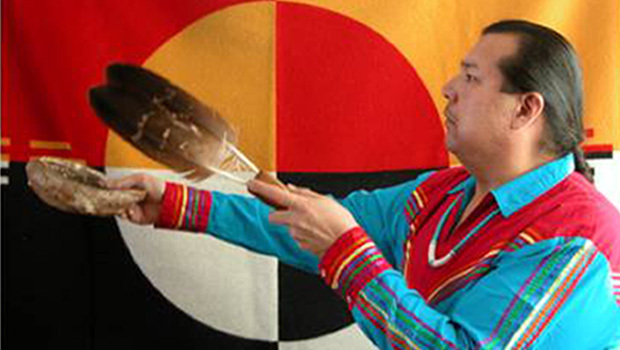 Come and experience Dennis King’s healing with Bear Medicine and share some of the stories of the Oneida Native American culture. Experience a powerful Fire and Water Blessing Ceremony with Dennis King, carrier of the Bear Medicine on Saturday Evening, April 18 at 7PM. A time for prayers, healings, private requests from Spirit and a Blessing for the New Year! Dennis will be traveling with another Oneida Native, John Orie, who Dennis said is taller than him ( for those of you who know Dennis…that has got to be TALL!) This powerful Bear Medicine is seldom experienced off the reservation! Feel and hear the Bear breathing and growling as true healing powers surrounds you. The Creator sends out spirits to help Dennis help others. He comes from a lineage of healers; his Great Grandfather and Great Uncle were healers…and now, he continues their legacy! In the Native American worldview, medicine is holistic in nature and considers spirit an inseparable element of healing, whose life-force manifestation in humans is called (atunhetsla) by the Oneida and (nilch’i) by the Navajo. Not only is the participant’s spirit important but also the spirit of the healer, the participant’s family, community, environment and the medicine itself. More importantly, healing must take into account the dynamics between these spiritual forces as a part of the universal spirit. “Instead of modern medicine’s view of separation that focuses on fixing unique body parts in distinct individuals separate from each other and the environment, Native Americans believe we are all synergistically part of a whole that is greater than the sum of the parts – healing must be considered within this context. Specifically, we are all connected at some level to each other, Mother Earth (i.e.,nature), Father Sky, and all of life through the Creator (Iroquois), Great Spirit (Lakota), Great Mystery (Ojibwa), or Maker of All Things Above (Crow)”. Native-American Medicine, Laurance Johnston, Ph.D. www.healingtherapies.com. “American Indian and Alaskan Native communities enjoy a rich history of traditional forms of healing. For hundreds of years, tribal healers have provided a range of herbal and ritual treatments for physical and spiritual problems. Tribal leaders and elders serve as spiritual guides and conduct elaborate healing ceremonies that include the entire community in ritual activities such as dance, chanting, meals, fasts, physical challenges, or sweats. In traditional healing encounters, prayer and ceremony tap the strength housed within family, community and Creator. Recently more American Indian and Alaska Native veterans are drawing on these resources for help with both physical and mental health problems. Traditional healing options can go hand-in-hand with conventional western medicine and counseling. In today’s fast-paced society, the illnesses are more extreme yet the same spirit prevails as when my ancestors practiced spiritual healing. Many people are embracing a holistic consciousness and in their awakening call upon Native healers; I am one they seek out. The scientific and religious communities are beginning to see the advantages of spiritual healing. In the future, however it turns out, we will need to create a deeper connection – with ourselves, with each other and with the Spirit or Creator. Many people feel that energy, spiritual or traditional healing methods bring them close to the Creator – whatever their experience of Him or Her. An overwhelming people suffer from stress at work and in other areas of their lives. Massage and touch therapy are now seen as acceptable and effective healing techniques and are being allowed in the workplace. My healing work is akin to those methods. Modern-day healers around the world whether they apply hands-on methods like me or use other techniques that they prefer, call this “Universal Healing” and it is available for anyone to use if they are aware of and know how to use it. Thank you to Dennis King! For the last couple of years, heartburn had become a frequent visitor. It dictated when and what I should eat. Having a meal passed seven in the evening no longer was possible. I found myself painstakingly scrambling to have my evening meals before the clock stroked 7 pm! The harder part was to be diligent in observance of mindful snacking after seven and before bedtime. It was a challenge! I decided to have two sessions back-to-back with Dennis King, my bout with heartburn disappeared! In the sessions, the bear came. Plants, roots and berries emanated from his breath as my bear relative examined me with light growls from deep inside him. I could feel the energy as it worked through my body. My hair stood on end. The healing came quick as I was able to eat a meal close to bedtime without feeling any signs of heartburn that same evening! I was elated! My relative, the healer with supreme knowledge of medicinal herbs that have antibiotic properties and such brought a much needed balance to this unwanted visitor (heartburn) that rarely ever comes for visits anymore. We forget the power of the animals to heal and Dennis demonstrates this power by working with bear medicine!